Leadership is a combination of innate and learned traits. That’s why great leaders are always pushing themselves to continuously grow. Jennifer Bridges, PMP, shows you three key leadership building activities that will help you become a better leader. Before offering her leadership building activities, Jennifer defined what leadership is. It’s the action of leading a group of people or an organization towards a common goal. It’s said that one can “lead by example and others will follow.” But like most quotes, it sounds easier than it is. Getting a group to do anything, let alone work together to accomplish a shared objective, is a difficult task. There are many questions you need to think about, like what should your team culture be, and what are the best project management tools for your tasks? But before you get into all the details, the first step, she noted, is to inspire, motivate and get results. This overall strategy provides a launchpad on which to build trust, earn respect, establish credibility and gain buy-in. These are the building blocks of true leadership. But how can you develop these skills and set yourself up for success? Well, leadership building activities can help you be the best leader you can be. 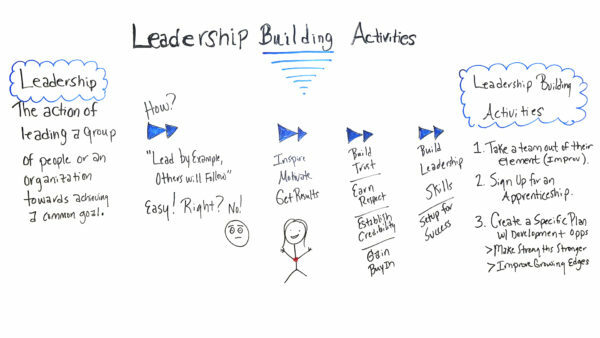 There are many activities that help build leadership skills. Jennifer suggested these three to get started. Take the Team Out of Their Element: The best way to approach this exercise is by springing it on the team unexpectedly and seeing how they respond in real time to such disruptions. This improv-type technique is popular because it forces teams to work outside of their area of expertise and exposes hidden strengths and weaknesses. As you watch your team struggle with new challenges, you’ll be able to gauge your own strengths and weaknesses as a leader outside of the typical office context. Sign Up for an Apprenticeship: If you work as a mentor under someone, you can learn new perspectives to hone your skills and explore other types of leadership, like servant leadership, for example. Create a Specific Plan with Development Opportunities: Take one of those many personality tests that are always circulating online, and learn about your behavior, including your strengths and weaknesses. Now you can apply this knowledge to your team leadership, sharpening and refining your leadership skills. Pro-Tip: For a more well-rounded understanding view of leadership, read our list of the 25 Most Inspiring Leadership Quotes. Take it Further: There are more formal approaches to improving your leadership skills. Leadership training options are both online and offline. Any investment, small and large, will pay back in dividends that will help you better lead any project. Today, we’re talking about Leadership Building Activities, but first of all, I wanna stop and I wanna clarify what leadership is. So, leadership is the action of leading a group or an organization towards achieving a common goal. Well, how do we do that? Well, I’m sure you’ve heard this quote, “Lead by example, and others will follow.” Well, that’s easy, right? No. That can be very difficult for all of us at best. So, how do we do that? So, how do we get a group of people or an organization to move towards achieving a common goal? Well, it requires inspiring, motivating, and getting results. Well, how do we do that? It’s based upon these principles, you have to build trust first, to earn respect, establish credibility, and gain buy-in from that group of people, organization. So, in order to do this, there are ways that we can build upon or improve our leadership skills and set up for success. So, here are just a few activities, this is not all of the activities, just some ideas of where you can start. Well, first of all, you can take a team out of their element. So, if you as the leader and your team are outside of your element, you may have seen like ropes courses or any outdoor type of things where people are not really focused on their work. So, just things come up sporadically, out of the blue, unexpected, and it’s truly improv at its greatest. So, you get the opportunity to see and experience your strengths. You may see some of your strengths arise, maybe some of them you didn’t even realize you had. And then certainly glaringly you’ll see some things where you need to improve upon. So, it’s a great exercise. The second one is you can sign up for an apprenticeship, like volunteer to mentor under someone, and let them show you ways, you know, on certain projects or certain initiatives, and be there to guide you, and show you, and give you the ability to practice those leadership skills. Number three, create a specific plan with development opportunities. So, there are all kinds of instruments you can use to perform an assessment. You’ve heard of, you know, DISC. You’ve heard of Myers-Briggs, and there are some other leadership instruments that you can use to assess, know where your strengths are, and where your growing edges are. So, what you wanna do is, you want to develop a plan with specific opportunities to make your strengths stronger and improve your growing edges. So, what would be some examples? So, maybe you’re very good at…maybe one of your strength is building teams or getting teams engaged. So, you wanna create a plan that will give you more of those opportunities. So, that’s a way to strengthen that muscle and continue to get even better. An example of improving your growing edges could be something like improving communication while under pressure. So, a specific plan could be maybe identifying certain books you wanna read or maybe a class that you wanna take, and give yourself specific opportunities to apply what you’ve learned. So, if you need additional resources on leadership building activities, then sign up for our software now, at ProjectManager.com.